That on average 80% of the visitors to Richard's Animorphs Forum have been here before? Thanks guys. Now go show off your inflated karma. Your eyes are not deceiving you: Richard's Animorphs Forum now has a total of two thousand, two hundred members. It took our community to grow by 100 members in one month and 3 days. That these DYKs are authored weeks (and sometimes months) in advance by Richard? I would like to congratulate estrid & Terenia on being chosen to join the RAF Staff. They will Initially join the team as Jr. Staff. It only took 10 days to completely reshuffle the Richard's Animorphs Forum staff complement. Here at RAF, we're lucky to have some wildly talented and intelligent members who have decided to contribute their knoweldge and teaching skills. RAFschool classes have been set up in a variety of subjects, from languages and mathematics to architecture and philosophy! I've set up a sub-board in general to include the aforementioned threads. Sign up for or start your own class!. Do you have an iPhone, Droid / Nexus One (Andriod), Blackberry or S60 (Nokia phone)? If so, you're in luck: RAF has partnered with Tapatalk to allow you to browse RAF Forum on your mobile device using the Tapatalk app. This is the closest thing RAF has to a mobile app. 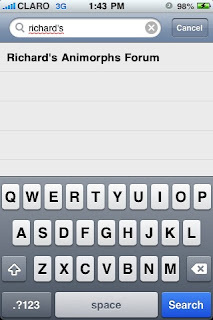 If you used to browse RAF on your mobile phone, then you are most likely aware of RAF Mobile (m.animorphsforum.com) which took you to our slimmed down version of the forum. Now you can use the native Tapatalk app on any of the above mobile devices. To get the application on your device, you can simply access RAF on your mobile device and an alert will tell you how to download the Tapatalk application. 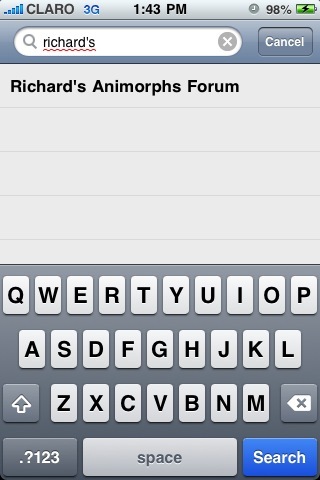 From the application, just search for Richard's Animorphs Forum (or RAF) and you are on your way. Or you can visit the Tapatalk website and get download links for your phone. Because I use the iPhone here are some sample screenshots. Thanks to Aluminator who just entered the relm of Gold Members. In addition to the fancy new color that distinguishes himself, he will enjoy 50 new karma points, and access to the D-Lounge. Another brand new member has donated. While donating to RAF is BaronConall's way of saying thank you to Richard's Animorphs Forum, it's time for us to say thank you. Of course, as a Donator he will enjoy an additional 10 karma points, the fancy gold color and access to the exclusive D-Lounge. Oh and welcome to RAF. We hope you enjoy it here. New-comer to Richard's Animorphs Forum and first-time donor Slyclops IX / Brian has donated. Welcome to RAF, welcome to the elite club of donors, and of course thanks for your contribution. Brian will now enjoy a myriad of benefits bestowed upon Donators and Gold Members. If you want to donate to RAF, feel free to hit up RAF Donate, and make your donation. That these RAF Did You Knows (DYK) have come out every week on Monday at 10:00am EST for one year now? It's amazing that with four of the best persons suitable for the job of RAF Staff, chosen some years ago, others in the not so distant past, one would reach the point where each of them are on their way out of the staff building. Okay, it's not a building, but rather a very elite club of RAFians who have shown themselves to be dutiful, trustworthy, and dependable. As most of you are aware, thanks to my position at a 9-5 job, I have become exceptionally busy since March 1, 2010. It's at these crucial times I depend on the persons who I've selected to look after the forum. It is quite unfortunate that we have reached the point where I must blog about the demotion of the entire RAF Staff (Claire, Kevin, Mike, Russell). When there are no posts or trickling posts in the Staff board it is usually indicative of two things. 1. There isn't anything of worth that the staff must deal with. 2. The staff isn't active in the forum. I can safely say that #1 is not the case. Why? There are quite a few things that were outstanding. So that leaves us with the dreaded issue of staff inactivity. At no point should a thread / issue to be dealt with be sitting down for days; unanswered, untended to. This was the case. As a result I feel that it is time to do some re-shuffling. Whoever wants to remain on board with myself heading the team can feel free to do so. I will however, take special interest in how each and every one of the staff members participate and take initiative with regards to the forum and issues relating to it. As I said on Twitter, if you feel that you can be active each and every day, take initiative and have the interests of Richard's Animorphs Forum at the forefront of your online life; then feel free to send me a message saying you wish to be selected for joining the RAF Staff. goom has been placed back on the administrator team. Phoenix004/Mike has been placed back on the Sr. Staff team. Visser 3 / Russell has stepped down from staff duties. 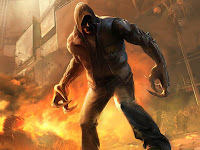 We're excited to release the second chapter of Megamorphs 1. Alert the press: another member has donated. This time it is Genies9 who donates for a second time. Her first donation gave her Donator status, this second contribution elevates her to the Gold Member league. What do you know? We have another first-time donor on the books! Say hello to comet226 who joins the growing list of RAF Contributors. She will now the perks given to those who donate. We're not fooling around this April; the member Ghost Tiger, another Venom account, has been banned from RAF. Props to estrid for contacting me about it.